Digital UK has today published a report highlighting what it says is the real value of Freeview as decisions are being made over future use of terrestrial TV frequencies. why radio station owners might have to pay more to stay on air if Freeview was closed down. According to the report, the "the economic surplus" stemming from spectrum allocated to digital terrestrial TV is approximately £80 bn.75% of households have access to Freeview, with 40% of homes using the service as the primary means of watching TV. Analysing recent developments, the report questions the need to convert more frequencies from TV to mobile data usage, because most data - even on mobile devices - is not downloaded via mobile networks and is this situation is unlikely to change, because it is cheaper to use wi-fi hotspots or home wireless networks. The report highlights research that shows only 18.3% of data from mobile devices actually travels via mobile networks, meaning over 80% of data downloaded to mobile phones and tablets is done via wi-fi. The TV frequencies being eyed up by the mobile network operators are the among the best for indoor penetration. But the report argues that indoor use is "precisely the situation where wi-fi offload can be most effective, since the wireless router is already inside the building." 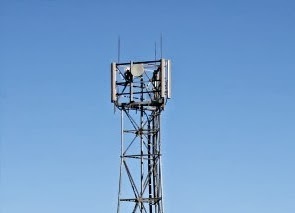 The report recommends refarming ex-MoD frequencies and current 2G mobile frequencies rather than those used for terrestrial TV. A sell-off of terrestrial TV frequencies, limiting what was available on Freeview could benefit Sky. The report cited Sky's own research that "showed that variations in the geographic availability of Digital Terrestrial Television had a statistically significant effect on the percentage of households subscribing to Sky’s basic and premium packages." The analysis concluded that Freeview was an important competitive constraint on Sky, and had a significant impact on demand for pay TV subscriptions. Research noted how Irish customers paid 30% more per user for pay TV services in 2011, compared to the UK, noting that digital terrestrial TV penetration is low in Ireland. A recent report concluded that it was not viable to launch new commercial digital terrestrial TV multiplexes in the country. Fears that Freesat would not be able to become a valid replacement for Freeview were also voiced in the report. Noting that its marketing budget is tiny in comparison with Sky, it highlighted how Sky pays channels to be in its premium subscription packages putting them out of reach of Freesat viewers. Freesat and Sky customers have different boxes and EPGs, but they are watching the same satellite signal. However, Freesat customers are not able to watch encrypted channels– these being the channels that are in Sky’s premium tiers. For example, Dave is not available on Freesat because it is in Sky’s ‘Entertainment Extra’ pack. Therefore if Sky is willing to pay a channel to be in one of its premium tiers, it deprives Freesat of that channel, and thereby weakens its competition. Today, when Sky’s main FTA competition is Digital Terrestrial Television, this is not necessarily a worthwhile approach. However, if consumers’ main choice was between Sky and Freesat, there would be every reason for Sky to seek to deprive its key rival of content , leaving Freesat with a weaker channel line -up. The report also highlighted the potential impact on the radio industry if digital terrestrial televison was reduced or abolished in favour of more mobile services. "Although using different radio spectrum allocations to that needed for TV, broadcast radio is facilitated by access to and use of many of the transmitter masts which have been built for digital TV coverage. "In the absence of DTT, the shared costs of these masts and other shared infrastructure and services would ultimately fall on the radio sector, and on other services using the same masts (including dedicated communications networks and mobile operators)"
Major decisions about the future use of terrestrial TV frequencies across Europe will be decided at the World Radio Conference in 2015.